Lightweight Nut Plates and Gaskets designed for two-hole oval flange mounted autosport / motorsport circular connectors. Lightweight protective caps for plug and receptacle motorsport / autosport circular connectors. About 30-40% lighter than standard models, feature an anti-vibration locking design. Can be supplied with or without a flexible, stainless steel micro wire rope lanyard. 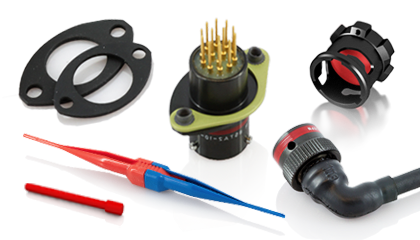 To make installation and maintenance easy, we offer a wide selection of tools and accessories. These include contact insertion and extraction tools, crimping tools, wire strippers and filler plugs.